Review: We have reached the conclusion of the Sea Lion story arc, but it also reads like a rushed conclusion given the build up of the last two instalments. 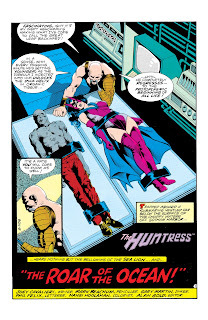 It only sees the Huntress capture the antagonist, but we learn very little of the villain's motives apart from an obvious desire to regenerate lost limbs, and feeling angry at the Huntress for sabotaging his plans. What was the extent of his plans is the bigger question. In this chapter, we learn that the Sea Lion demonstrates a strong understanding of genetics, and especially understands nucleic acid denaturation, which is the breaking apart of DNA and RNA. However, he is not interested in denaturing DNA in the traditional sense. He doesn't just want to break apart the hydrogen bonds that hold the two strands of DNA together to form the double helix. He literally wants to break apart the covalent bonds that hold the individual nucleotides together in a single strand into much smaller basic molecules that he can then reassemble into the DNA of other life forms. The Sea Lion has all of the right (expensive) equipment to achieve this denaturing and restructuring of DNA, which makes you wonder what else he has planned. His plans clearly goes above and beyond just seeking revenge against the Huntress and his accomplice, Dr. Peake, for failing in his objectives. Understanding the Sea Lion's motives required further backstory than the seven-page format afforded writer Joey Cavalieri. Cavalieri already setup an interesting premise for the character by establishing that he is a double amputee who clearly wants to get back the limbs he lost, and possibly even profit off of Dr. Tori's research at her expense. We also learn that the Sea Lion is very intelligent, but is also very angry about something, which also drives his motivation in this story. The problem is we never get to learn those details because of how abruptly Cavalieri ends this story, possibly due to Crisis on Infinite Earths lurking around the corner. With very little time left, he most likely had to start wrapping things up in order to set Helena Wayne up for the Crisis event. On the subject of Helena Wayne, she is admittedly the best thing about this story. Following her capture by the Sea Lion in the last issue after she exposed him and his accomplice as the thieves behind Dr. Tori's compromised research, the Huntress finds herself at his mercy. Strapped down with the threat of death brushing too close to home, the Huntress is forced to quickly think her way out of a deadly situation. In this chapter, Helena Wayne did not have immediate access to her utility belt and had to figure out how to shift her helpless situation back to her favour. She accomplished this by taking advantage of the Sea Lion's bragging. While he distracted himself by listening to himself talk, Helena managed to position herself in a way that would put the strap restraining her in direct path of the Sea Lion's formula contained in the needle on his prosthetic hand. Helena rationalised that if the formula is designed to break up the covalent bonds that holds DNA together, the formula could similarly be used to disrupt the covalent bonds holding the strap together, breaking it down to its more atomic form, facilitating her own escape. The other way Helena Wayne demonstrates her quick thinking skills in this story is in deciding her "mode of death." The moment she breaks free, the Sea Lion attempts to lock her in the chamber she is in, and suffocate her to death by cutting the oxygen supply to the chamber. Helena is then left with the choice of asphyxiation, or blowing herself up by taking matters into her own hands. She opts for the latter, rationalising that she has a stronger chance of surviving "shaking things up" and forcing the Sea Lion to surface than she does at "waiting for a miracle." The confrontation between the Huntress and the Sea Lion was a fascinating juxtaposition between two equally determined people who don't give up easily. Both the Sea Lion and Huntress demonstrate that they are people who prepare for every worse case scenario and tend to have the right tools available for when those situations arise. The rest, however, was a game of chess. Which of the two would end up having the better strategy for defeating their opponent? While Helena could've certainly used the Sea Lion's physical disability to her advantage, Helena also demonstrated in this story that she didn't need to resort to such low-hand tactics to get what she wanted. All she had to exploit was the Sea Lion's own vanity to knock him off his high horse, and ultimately off his feet, both literally and figuratively speaking. Though there was certainly a lot more story to tell than what the upcoming Crisis on Infinite Earths event facilitated writer Joey Cavalieri, the way Helena Wayne was depicted in this story's conclusion made the reading worthwhile.